Got too much money lying around and don’t know what to do with it? Well, why not… buy a gold-cased, diamond-encrusted iPhone? Now you can, and for a mere £22,995.00. I don’t think there’s a contract included in that. 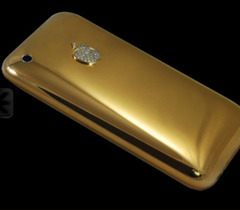 Sold by stuarthughes.com it’s described as: “the world’s first solid gold and diamond iphone 3gs”. They don’t mean totally ‘solid’ otherwise there’d be no room for the useful but definitely not gold plastic and cheaper metal parts, like the battery etc, but it’s more than just a case. The goldsmiths take the back plastic back off and reworked the back with gold. Also then re-making the apple logo with 53 diamonds inset on the back. Also available in Rose gold with pink diamonds. If you’re not an iPhone user but say, have a Blackberry or perhaps a Nokia you want to give the heavy bling treatment to, you can do that too. On sister website www.republica-fashion.com, there’s a diamond Blackberry, which, the press release claims is covered in “very rare python skin”. The little trinket is here – selling for £3,495. I really don’t know what animal conservationists would say about the python skin, but that fact isn’t mentioned again on the website, so perhaps the python bit has been pulled. Diamonds are definitely still there though. This website is also home to the worlds most expensive belt, so if you’ve been looking for that, do visit www.republica-fashion.com as well. It’s a Gucci one, btw.